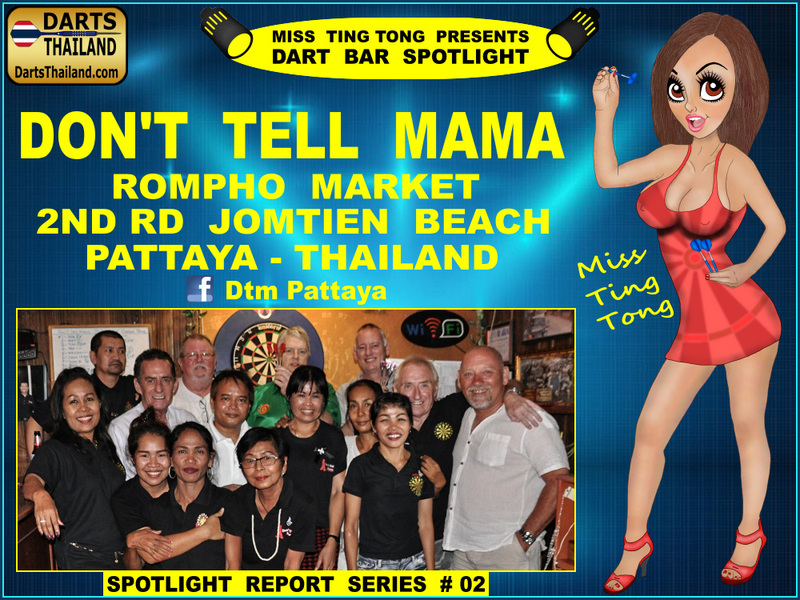 Welcome to the second spotlight darts bar in my new series spotlighting some great darts venues here in Thailand. There’s no particular method or order to this series – just reporting some great darts venues we happen into and want to introduce to you. For all of you players from our recent New Cowboy VS. DTM friendly who expected this to be the report of that event – it will be published soon. Still selecting from tons of photos and waiting for the report. But during that event I had the opportunity interview the individuals who make Don’t Tell Mama the popular and successful bar that it is today. 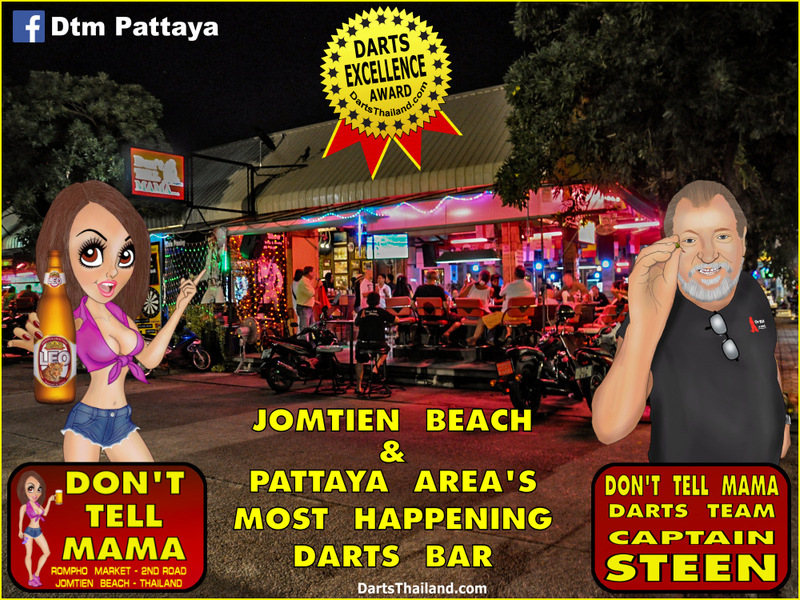 Anyone who’s ever visited Thailand knows that bars here abound – especially in the Pattaya area where more bars exist than anywhere else on the planet. So – what makes a successful bar or pub? Good luck? No, but a bit of good luck never hurts. Location, location, location? Yes, sure a factor but not a guarantee to becoming a successful business. The most important factor is the owner / management of the business and the particular “people personality” of these individuals that insures attracting new customers and more importantly developing a repeated patron base of regulars. Don’t Tell Mama definitely has this going for it and now it’s my pleasure to introduce you to those “people persons” who make this happen at DTM. DTM is owned by May & Robert and their good friend Steen is not only their darts team captain but the idea guy developing their popular darts events. 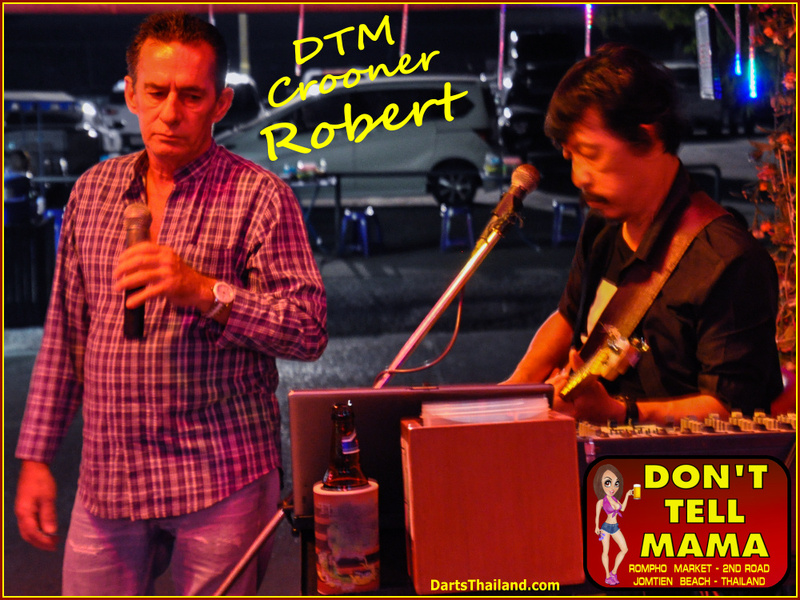 The original DTM was established in 2002 and was located on Pattaya’s popular Walking Street. At that location DTM was only a bar – no darts or pool table. 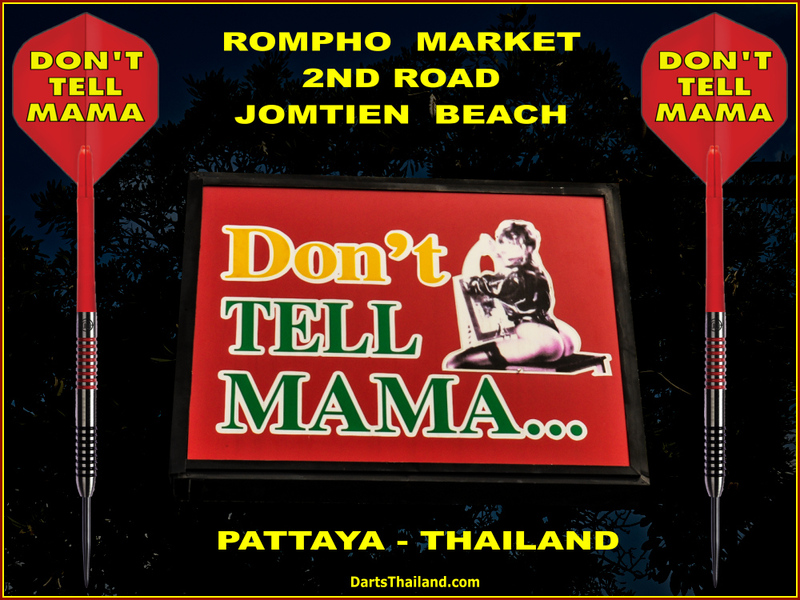 After nine years they moved to their current location at Jomtien Beach in Rompho Market on 2nd Road in 2011. The new location has a pool table and darts – playing in leagues PLUS live music 6-nights a week. In 2012 Steen joined them and DTM’s darts scene and its popularity has been growing ever since. 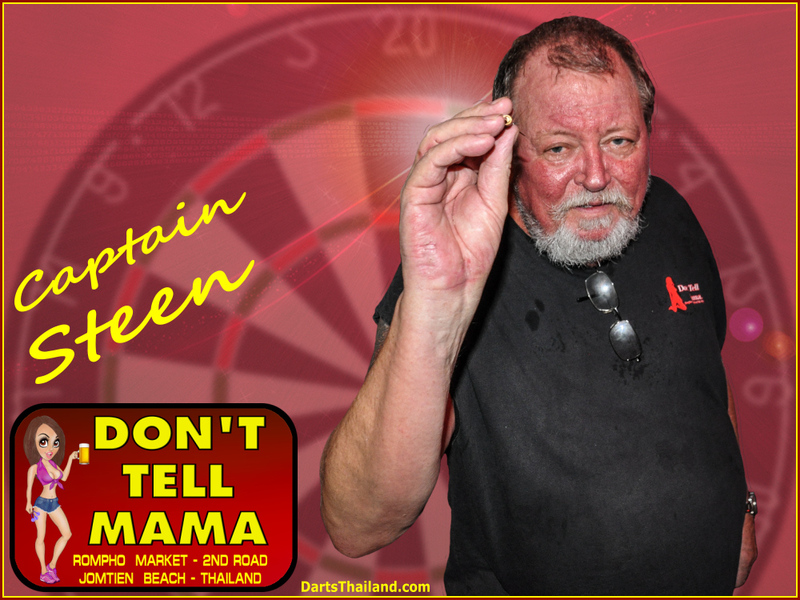 The idea of a Friendly Darts Challenge between New Cowboy in Bangkok and DTM came about when Steen happened to meet Johnny of Darts Thailand on FaceBook in 2014. They both share the same love of darts as a great social gathering for like-mined players to meet. One Friendly Match at home the next one away with the first one played at DTM. Recently they gathered at DTM for Round #5 and I think it’s safe to say that this event has become the highlight of darts in both their darts venues. I know that Miss Tia and all her dart players look forward to DTM’s next visit where the fiercest competition is between our host venues trying to outdo their hospitality to the visiting team. So is everything about running a bar or darts nothing but “Happy Days of Wine & Roses” everyday? Hmm, I asked Miss May what she sees as the best & worst things about running DTM. BEST – meeting good people from all around the world. WORST – Guys that look down on Thai women. Then I asked Steen what he sees as the best & worst things about running darts at DTM. BEST – getting looked after by a great host bar. And good players – not necessarily high scoring players but good team players. WORST – substandard admin support in our darts league. Steen also added that he’s been playing darts for 35 years and loves playing darts. And wishes he could teach all players their “double- out numbers”. Wow – no small personal challenge for any seasoned, knowledgeable darts player! In conclusion – anyone who thinks running a successful bar just involves buying a bar and sitting at the bar sipping a drink and everything magically happens – has never had anything to do with the business. Funny thing is most can’t name single factors why they like or think a particular bar is good. All the little things are “just right” and you feel comfortable and at home. Ah, this does not just magically happen. It’s due to the special attention to detail of management who make it seem so natural and comfortable. Ha – don’t believe me? With so many bars here “for sale” -buy one for yourself and see just “how easy” it is to run a successful business ! Friendly Darts Challenge Match #5 Report & Photo Gallery from DTM – Coming Soon . . .